Daryl Johnson (Worcester Park, United Kingdom) on 31 May 2011 in Documentary & Street. all are adorable, which one would he pick? @Jojigirl: The most tasty Jojigirl! I wonder what the birds are thinking . . .
@Ronnie 2¢: They have quite small brains don't they Ronnie? @kerfendal: But these ones are easier to keep an eye on kerfendal. Thank you! 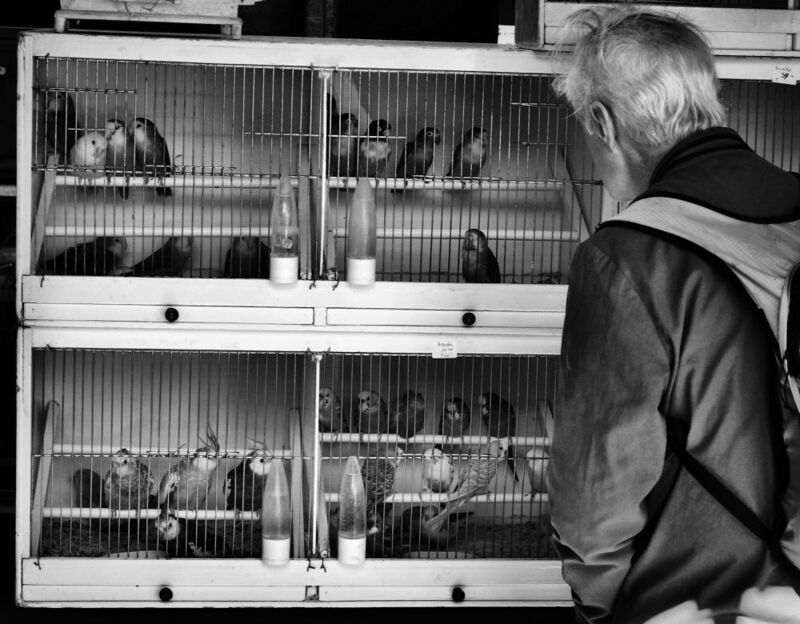 Sort of like the bird market in Hong Kong. Nice shot of this man studying the birds. @Steve Rice: The visuals are far more overwhelming in Hong Kong, this was a sedate little street Steve! The bird symbol of freedom, always sad to see him in cage ! @Kiki: Thanks Kiki! Yet we are happy to see him in breadcrumbs, it's ironic don't you think?